Funeral services for Dr. Garey Eugene Ware, O.D., took place at 11:00 a.m. Monday, Nov. 26, 2018 in the chapel of Golden Funeral Home with Mr. Casey Clement and Mr. Waymon Swain officiating. Interment followed in Memorial Park Cemetery under the direction of Golden Funeral Home. The family received friends Monday from 9:00 a.m. until 11:00 a.m.. service time at Goldens. 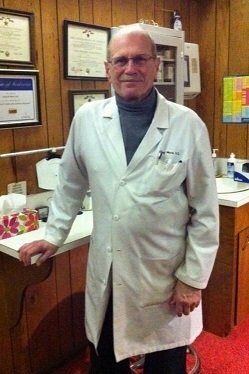 Dr. Ware, owner and operator of Dr. Garey Ware Optometry for forty-four years, passed away Thursday, November 22, 2018 at the age of 77. He was a member of Central Church of Christ and served in the United States Army First Infantry Division Medical Unit, as Captain, during the Vietnam War. Dr. Ware was also a member of several organizations including, The American Optometry Association, The National Academy of Optometry, The Association of Regulatory Boards of Optometry, The Society of the First Infantry Division, and The Fellow American Association of Optometry. Some things he enjoyed were reading, working in the yard, duck hunting, and taking care of his dogs, cats, and other animals. Through Dr. Ware’s organ donation, sight will be given to someone in need. Dr. Ware is survived by his daughter, Josie Ware Gustafson and husband Jimmy of Tallahasee, FL; sons, Karl Eugene Ware of Bastrop, LA, and Jacob Kurt Ware of Twisp, WA; mothers of his children, Suzanne Winton Ware and Barbara Ware-Thuerwaechter; sister, Laney Ware-Heusel and husband Dickie of Mer Rouge, LA; grandchildren, Karley Elaine Ware, Olivia Elyce Ware, Louis Archibald Ware, and Winton Gustafson; nephew, Trey Heusel and wife Milissa and their children, Sam and Sara. He is preceded in death by his parents, Eugene and Elsie Ware; son, Edwin Eugene Ware. Serving as pallbearers were Dr. Bill Marionneux, Randy Lowery, Ralph Jones, Trey Heusel, Jason Crockett, and Jeff Caldwell. Honorary pallbearers were Dickie Heusel, Dr. Joseph Reynolds, Melvin Eubanks, Dr. Robert Castiglione, Michael Stephens, and Larry Wilson. In lieu of flowers the family requests donations be made to Central Church of Christ or The Morehouse Parish Humane Society.